' ' Cinema Romantico: Who Was The Golden Globes-iest Golden Globes Nominee? Who Was The Golden Globes-iest Golden Globes Nominee? Nominations for the 244th Golden Globes were announced on Monday, and in an effort decode their meaning in advance of the forthcoming Academy Award nominations, pundits worked late into the night, maneuvering potential front-runners, dark horses and also-rans across their awards season battle maps. And while in a year where so many women have made so many superb movies, it is disconcerting to see no women nominated for Best Director, just as it is disconcerting to see the conspicuous lack of Jordan Peele love. But then, as a voting body the Hollywood Foreign Press Association is about as trustworthy as a baseball team’s fanbase stuffing the online ballot box for its favorites at the All-Star game. Why anyone takes All-Star game appearances into consideration for the Hall of Fame is beyond me, just as it is beyond me why anyone would take the whims of the Hollywood Foreign Press Assocation seriously. After all, The Globes were a ceremony dreamt up by Queen Marie Antoinette and held at the Palace of Versailles where she would bestow awards to theatre players with whom she most wanted to eat chocolate and drink champagne. (The Hollywood Foreign Press Association took control of the Golden Globes, of course, during the Paris Peace Treaties of 1947.) 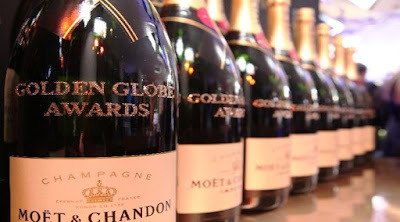 The Globes, as I am forced to say every year, are a glorified cocktail party, a means to hobnob, and nominations correlate less to artistic quality than who the HFPA wants to invite to their soiree. At first blush, Mariah Carey’s nod for Best Original Song for The Star might seem a contender, but that song has emerged, per the punditry, as a legit Oscar contender. And so even if I am certain the HFPA is teeming with joy at getting to mingle with Mariah, it is a nomination given to the prevailing trends, which does not have that necessary quizzical Globes-iness. Christopher Plummer might seem another possible contender, given that his nod for “All the Money in the World” is the role he re-shot in a mere one week’s time as a replacement for Kevin Spacey in the wake of the latter’s rightful plummeting into the abyss. That, however, seems like a deserved middle finger to Spacey as much as anything, and evidence that HFPA does at least sometimes consider real world concerns, if only in a reactive, we-gotta-do-something kinda manner. No, the co-winners of this year’s Honorary Meryl Streep HFPA Award are Emma Stone and Steve Carell. “The Battle of the Sexes”, in which Stone plays Billie Jean King and Carell plays Bobby Riggs in a re-creation of the lead-up to and playing of their infamous 1973 Battle of the Sexes tennis match, was critically well-received, though its box office was not compelling, and these are not performances that will stick around for the tough late winter months of awards season. No, that Stone and Carell earned nominations for, respectively, Best Actress and Best Actor in the Musical or Comedy category give away the game, as this acting category has long served as the HFPA’s sly fail-safe for when certain beloved attendees might not be able to score an invite otherwise. And while Carell is always a solid awards show guest, good for a comic presenting gig, it is Emma Stone, more than most, who needs to be at the Golden Globes. Because as Jack Nicholson prepares to celebrate his 81st birthday next April, it has become apparent that the awards shows special interest groups are pushing hard for Ms. Stone to assume the mantle of First Awards Show Guest. That means you get her to the ceremony by any means necessary. In that light, we here at Cinema Romantico whole-heartedly endorse this nomination.